It’s getting cool outside! I enjoy walking in the early morning, and have noticed a certain nip in the air. When I dug through my outer gear to find a hat, I realized that I did not have one. Not being a person who likes hats, I tend to shun them, or use scarves, instead. However, I’d like to continue my walks later into year (or farther into winter), so a hat seems like a good idea. Found Charisma Marble in Color Granite in my stash. This is a Loops & Threads product put out by Michael’s. I don’t know whether I purchased it, or “inherited” it from someone else. There was only the one skein. With only 60 yards of bulky yarn on the skein, and #10 circular needles, I wanted to go with something simple, so I developed a quick moss stitch design and knit until I nearly ran out of yarn. Cast on: 44 stitches, Knit 1×1 rib for 2″ (I used K1tbl, P1 to make the knit stitches stand out a little better). Then place marker, and Row 1: K1,P1 around, Row 2:P1,K1 around for 4″, then *K2tg, P1* alternate rows until 8 stitches are left, and thread tail through remaining stitches. Very easy – took about 2 hours. Fits snugly and comfortably, and will be warm for the morning walks. Mr. Bear’s head is much bigger than mine, so the fit is jaunty for him. I visited River Knits last week – I don’t get the chance to stop by that nice store in downtown Lafayette. This was the first time I had a chance to check out the new store, and I found it as charming as the previous location. Found a new super-bulky yarn called Lumio color, in color Blue-Green, by German manufacturer Schachemnayr. Lumio is a cool super-bulky yarn with reflective thread throughout. Lends itself to warm safety gear like hats and scarves. I thought a hat would be fun. Adjust as necessary, and switch to DPNs as necessary to 3-4 stitches on each DPN (12-14 stitches remaining). Cut 18″-24″ tail and thread through remaining stitches and weave in. I forgot that super-bulky is a little tricky because it doesn’t move as easily as DK or lighter-weight yarn. Note that the bright bits in the hat color are actually the reflective thread bouncing the camera flash. BONUS – Hat Designer! If you visit the manufacturer website, select “Tips and Trick,” and you can play with their “hat designer” app to create your own hat. Includes patterns for knit and crochet. Gin & Tonic Hat Pattern from Tanis Fiber Arts by Julie Crawford. Yarn is Yarn Bee Snowflake Wool Blend (not sure of the color – lost the band). 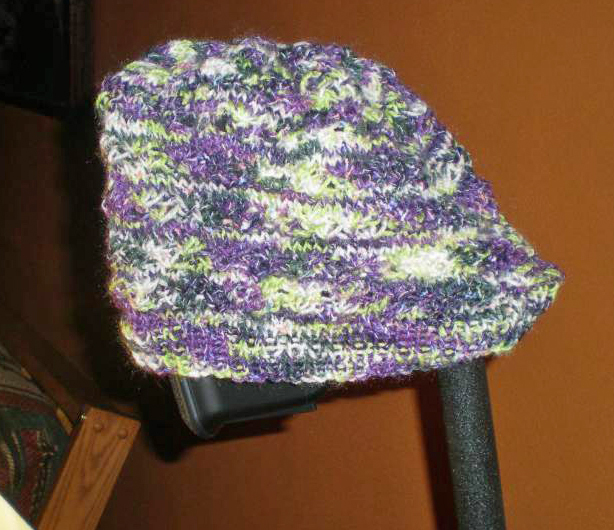 Hat is nice – it was one of those “learning a new stitch” projects and this project has an interesting Daisy Stitch. The finished hat is comfortable and stretchy. While the pattern sample was knit in a multi-color yarn, my version doesn’t look as nice, color-wise, although the light in the picture makes it look better. Not sure what I think about the yarn. I really shouldn’t stop at Hobby Lobby between meetings – I tend to buy whatever yarn is on sale.